Day #70 « 1 guy. 2 bike trips. It is with a combination of great joy and overwhelming sadness for me to say this: I am in Berkeley, CA. 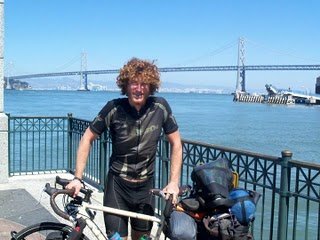 Yesterday I finished riding ~4,000 miles from Savannah, GA to Berkeley, CA (through 13 states) on a bicycle over the course of 70 days. I’m finished. The Western Express ends somewhere in the San Francisco Bay with a 50 minute ferry ride to downtown San Fran. I rode with the BikeTheUSforMS crew, so when I got off the ferry, there was thunderous applause from all their friends & family followed by an excellent banquet with speakers–one of which was an ex-world-class-cyclist who was diagnosed with MS in her prime. I’d like to extend a thank you to _everyone_ who I met on this adventure. From GA to CA, I biked through 13 states, and I met so many fantastic people who helped me out, gave me advise/encouragement/cash, put me up for the night, told me where I was and where to go, etc. There’s way too many States and names to mention, so I’m not even going to bother trying to fill this post with the names & places. You know who you are. If you’re visiting this site and I met you along the way: Thank You. From the bottom of my heart: Thank you _so_ much! I made it all the way without breaking a single spoke. I wish I could say I made it the whole way without a flat, but ~8 miles from the ferry I ran over some glass. As I was inspecting my tires for damage, I saw a massive thorn embedded in my front tire. As soon as I pulled it out, the gas poured out. If I had just left that thorn in, I would have made it ~4,500 without a flat. Instead, I had to change a tube for the first time and sprint up San Fran-ish hills so I could make it to the ferry by 14:00–which was supposedly the last ferry of the day. Man, this trip has been a challenge all the way through the last day! Having to say goodbye to all the BikeTheUSforMS guys was difficult. There were 25 riders. I’ve been with these guys since Kansas. Every day I saw them, rode with them, sweat with them, and took many-a safety breaks with them. I had 30 seconds to say goodbye to each of them; it just wasn’t sufficient. I feel so close to so many of them, but I’ll probably never see most of them again. I’m under a lot of shock right now. I’m sitting in my cousin’s kitchen in air conditioning typing on a laptop. I woke up at 7:30 AM (which is “sleeping in” for me at this point). I don’t really know what to do all day without biking at least 40 miles. Just trying to imagine a normal day in my ordinary life seems so absurd and boring. Our last night in the woods was shared by peacocks and roosters. Little did I know how annoying peacocks are at night. It was way worse than the ducks that quacked all night in Larned, KS. Once 6am hit, the roosters joined in on the madness. Needless to say, I was up and ready to go with the early crew without an issue waking up. Our first day in California was wretched. As we crossed the border, the terrain was indistinguishable from the desert of Nevada. The welcoming sign was nearly the most unimpressive out of all 13 states–other than the Virginia sign (which didn’t exist) and the Tennessee sign (which was knocked over like it had been hit by a car). Worst of all: we had to climb Carson Pass–which had nasty steep uphills tied with the since-forgotten humidity. I ran out of gas several times going up the pass. It got so dark that I ended up not making it to the MS campground before I called it quits; the next morning I discovered I stopped just 1/2 a mile short. We are VERY proud of this HUGE accomplishment. When you started out, we knew that your determination and drive would get you to where you wanted to go. As mentioned to you a few days ago, we would have loved to have been there to greet you when the ferry hit the dock. Although not there physically, we were there spiritually. We would like to extend a HUGE thank you to the BikeTheUSforMS folks! After you ended up solo in NC, we were very worried about your safety. Once you told us that you met up with this terrific group of people, we felt much more comfortable with your journey. Remember, good things happen to good people. Tell our family in California hi and thanks for putting you up. Now begins the ‘thought’ of shipping your stuff and flying home. Again congratulations on accomplishing your goal! WOO HOO!!! I’m so glad that you safely completed your journey…although there is still the journey of life ahead. Congratulations to you on such an amazing feat. You have inspired me (and many others I’m sure). Yet another example of the accomplishments that we can achieve when we set our minds to it. We’re all very proud of you and wish you much luck in your re-acclimation to society, which will be a completely different challenge. Time to plan that AT through hike!!!! YOU ROCK!!!! This is super super late, but congratulations on making it! It was pretty awesome having read your first couple of blog entries, then seeing your website again on various boards as my girlfriend and I trekked across the country, until the Western Express broke off from our trail, at least. I only just now ended up on your site again, as I was getting nostalgic and looking through my bike touring research. Also, well done on keeping up with the Bike the US for MS guys for so long! We rode with them for several days in Kentucky and Illinois before losing track of them, but they were an awesome group. Finally, good luck on the Northern Tier trip, it should be a blast! p.s.- you should totally write to Raleigh about your trip and the lack of flats. They’re super appreciative of happy correspondence- I got a package with all sorts of gear (stickers, shirt, jersey, CO2 cartridge, etc). Very cool company.